"Over the next 15 years, 600 cities will account for more than 60 percent of global GDP growth. Which of them will contribute the largest number of children or elderly to the world’s population? Which will see the fastest expansion of new entrants to the consuming middle classes? How will regional patterns of growth differ? 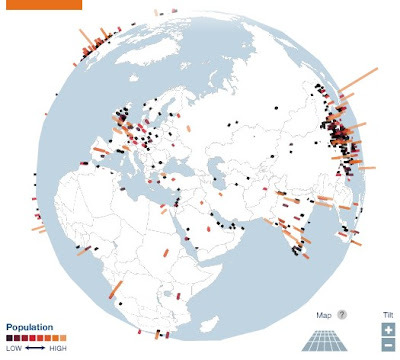 Explore these questions by browsing through the interactive global map which contains city-specific highlights from the McKinsey Global Institute’s database of more than 2,000 metropolitan areas around the world." This is part of larger McKinsey Global Institute report, Urban world: Mapping the economic power of cities.